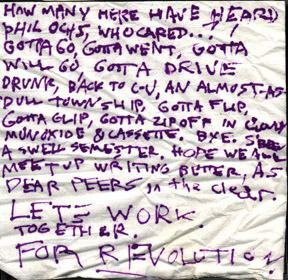 How many here have heard of Phil Ochs, who cared . . . ? I gotta go, gotta went, gotta will go, gotta drive drunk, back to C-U, an almost-as-dull township, gotta flip, gotta glip, gotta zip off in cloudy monoxide & cassette. Bye. S'been a swell semester. Hope we all meet up writing better, as dear peers, in the clear. Lets work together. For REVOLUTION. like the ideas in my stories, i am invisible, inevitable (sic), indecipherable, barely here, did i mention that i vanish? 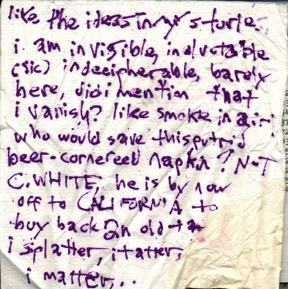 like smoke in air: who who would save this putrid beer-cornered napkin? Not C. WHITE, he is by now off to CALIFORNIA to buy an old tan. i splatter, i tatter, i matter. William ended up crashing on the couch. No one got a DUI or got into a life-altering automobile accident. We got him to stick around by promising we would show him the cool new things that were happening on the Internet, where you could now see pictures from the news on AOL. This was the first time William saw the World Wide Web.